Barnum transports us to the nineteenth century circus, complete with talented aerial artists, acrobats and brightly coloured corsetry. The show’s atmosphere was created the moment we walked into the auditorium, complete with circus sound effects, jugglers and a contortionist that caused laughs and shrieks from the audience. The show’s storyline tells the tale of PT Barnum (Brian Conley) and the dreams he pursues with the support of his wife Chairy (Linzi Hately). A more detailed biography is included in the show’s program and provides a very interesting read! 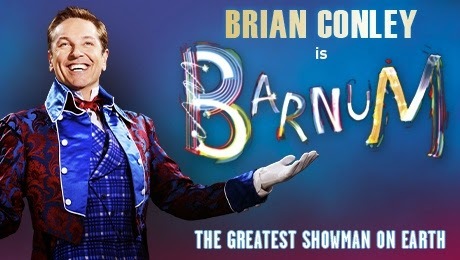 Born performer Brian Conley plays the role of P. T. Barnum with natural comic timing and charisma. He has a fantastic relationship with the audience and his occasional ad-libs reflect a true comedic actor. It doesn’t even matter that Conley’s singing voice is not as technically secure as his fellow cast, as it personalises the role. A particular hats off goes to Conley for getting his tongue around the quick lyrics of ‘There is a sucker born every minute’. Linzi Hately brings a host of experience to the role of Chairy and her comic timing is contrasted with beautiful sensitivity during her duets with Conley - she really is a loveable character. In addition, Kimberley Blake takes on the role of opera singer Jenny Lind with just the right amount of ‘diva’. Chorus numbers include the catchy ‘Come follow the band’ and they are all supported with creative choreography and energy from the multi-talented ensemble. It is just a shame that show’s storyline does not have more to offer. 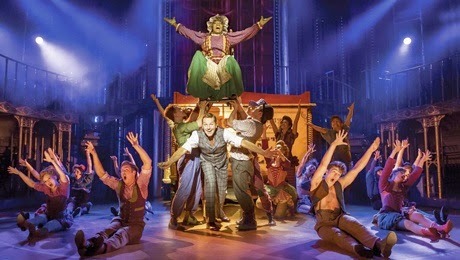 Barnum continues its UK tour until the 1st August 2015.